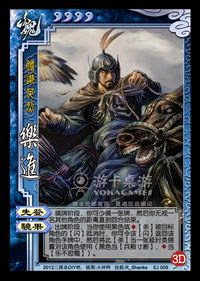 During his drawing phase, Yue Jin can draw one fewer card and select any character. The selected character is then considered to be within Yue Jin's range for the rest of his turn. When another character plays an escape to Yue Jin's non-heart attack, he can return the escape into the target's hand and place the attack in front of the target. If it is diamond, it is considered to be a capture. If it is a black suit, it is considered to be a starvation. If Yue Jin uses "Mount" the target character is inside of Yue Jin's range for all other cards as well. Not only for attacks, but also for Steals and Starvations.